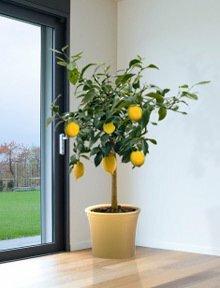 The Meyer lemon tree is one of the most rewarding plants to grow in the home. It is originally from China and was introduced to the United States by agricultural explorer Frank Meyer in 1908. These trouble-free trees are low maintenance and hardy. They can easily adapt to the indoors or outdoors and still produce a heavy crop. The fruit is juicy, sweet, and tender, a cross between a regular lemon and a mandarin orange. 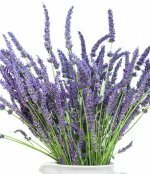 They are very attractive with glossy green leaves and intensely fragrant white flowers that fill your home with a heavenly scent. 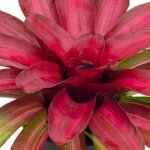 This plant will look great in a decorative pot on a patio or apartment balcony but must be moved indoors during the winter. When the flowers leave, clusters of lemons appear. The tree is long-lived and capable of producing fruit for over 30 years. The fruit of the tree is very beneficial to our health because of its high Vitamin C and potassium levels. Vitamin C is great for strengthening the immune system and potassium helps with blood pressure issues. It also works as a cleanser, ridding the body of toxins. You can harvest fruit year-round, The fruit is green in color until it matures. The Meyer lemon is rounder, sweeter and less acidic. The fruit also bears a unique hint of orange flavor. The flesh, juice and rind are a favorite of chefs and bakers all over the world. Light: A sunny room with southern or western exposure seems to work best when growing the plant indoors. If the light is insufficient, you can supplement lighting by setting it under grow lights or shop lights fitted with one cool and one warm bulb. You must give it as much light as possible because the key factor is ample sunlight. You’ll find your tree will do best with at least six hours of direct sunlight per day--even more if possible. This can be done by placing it within 6 feet of a sunny window (too much direct sun can burn your plant). Water: As for watering, usually once a week is satisfactory. More citrus trees suffer due to over watering. If you’re growing the tree in a container, make sure the soil is completely dry a couple of inches down before watering. Test the soil with your index finger by simply plunging your finger into the soil. If it’s still damp or moist, hold off on watering for another day. If your finger emerges completely dry it’s time to water! Humidity: Citrus trees love humidity, and indoor environments are often quite dry. To raise the humidity, simply mist the tree with tepid water (not warm and not cold) every other day or so. This increases humidity levels around the tree and provides the environment it needs to thrive. Fertilizer: Use organic fertilizers, as a balance to the salt based products (the artificial ones). Feed sparingly, about every five weeks, with a citrus fertilizer during winter months. Leach plants to remove excessive salt build-up in the soil. Soil: Sterilized potting soil. It should be fertile soil with 1/3 of the soil mix being perlite or vermiculite to keep the soil from getting waterlogged. Sandy, well-drained, dry, alkaline soil works great also. Repot: After 3 or 4 years in the same pot, you need to replace the soil since it will be depleted of nutrients. You can either replant into a larger pot or prune away some of the outer roots with a sharp, knife and replant back in the same pot with fresh soil. Growing a Meyer lemon tree organically will reward you and your family with fresher and tastier fruit for your consumption. Plus, plants like these are very helpful in making sure that you would have clean and fresh air in your home.